You’d think that I’d be most busy preparing stock for the show instead of re-designing some of the old soap styles, but nooooo…. I’ve been too busy re-doing some of the previous designs AND adding a bit to them to round out the GEEKSOAP geeky soap line. 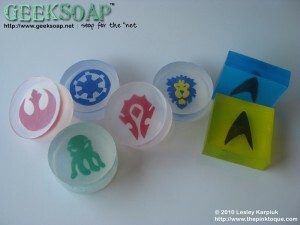 Most notably adding an Alliance version to the Warcraft GEEKSOAP series. And let me tell you… making the Alliance geek soap was a pain in the you-know-what… just like the Alliance are in-game. Heh heh heh :) (I crack myself up.) So feast your eyes upon the re-designs here… instead of colored soap with a black silhouette I’ve reoworked them to be clear like the majority of the GEEKSOAP line with colored, hand carved and cut images inside. I like it better this way and am really happy with how the re-designs turned out. And ooooooh that Cthulhu re-design was my absolute favorite! Cthulhu, as some of you remember, was the first GEEKSOAP in the series that inspired more… and the old design was great, but with the new “angrier eyebrows”, the NEW design is even better – don’t you think? As always, all of my geeky soaps are available in my Etsy Shop! http://www.geeksoap.net !